When it comes to affordability, it doesn’t get more value-for-money than these guitars. “Cheap” is a relative notion. If you’re a 40-year-old beginner, you’re likely to drop more cash on a guitar than a teenage shred machine. Or if you’re comfortable in life, then a grand may just be pocket change. The bottom line is: like taste, affordability is subjective. And thus so are ‘cheap’ guitars. So with that in mind when building this list, we’ve only picked instruments that cost less than the sum of their parts. Whether it’s fancy pickups, uniqueness or a solid build for a couple of hundred bucks, these guitars represent huge value for money. It’s big, it’s brawny and it’s bold – the Reverend Jetstream HB represents a tonne of value for its price tag. Although it excels in rafter-shaking rock ’n’ roll tones, this offset guitar has a few nifty tricks that make it more versatile. Add to that quality construction and components, and you’re left with one of the best electric guitars under $1,000. The Jetstream HB is identical to the Jetstream 390 – except for its pickup configuration. Rather than a trio of P-90s, the Jetstream HB sports two humbuckers: The bridge unit is slightly overwound for extra punch, while the neck pup is a vintage-output, PAF-style model. Both use alnico V magnets. Those pickups make the Jetstream HB ideal for big, wide-open rock tones: warm and luscious when clean, and full-bodied with the distortion pedal stomped. However, thanks to Reverend’s ingenious Bass Contour knob, you can dial down on the low end to emulate single-coil tones with those humbuckers. Reverend guitars are known to sport many premium appointments despite their modest price tags. And the Jetstream HB is no exception. It has a comfortable roasted maple neck, a Wilkinson WVS50 IIK tremolo, pin-lock tuners and high-end electronic components. A korina body and a 12-inch-radius roasted maple/blackwood fretboard (depending on the finish) complete the other notable specs on this guitar. By and large, we wouldn’t call the Fender American Special Stratocaster a ‘cheap’ guitar. But if you must have an MIA Strat, then this is your most affordable option. It costs about 30 per cent less than an American Professional Strat, yet both guitars share many specs in common. The American Special series is essentially an update of the erstwhile Highway One line-up. Gone is the thin satin body finish, replaced by a glossy polyurethane finish that offers more shine and durability. The necks on both guitars, however, still bear that smooth satin finish. But the biggest difference between the American Special Strat and the Highway One model is in the pickup configuration. This guitar comes equipped with three Texas Special single-coils, which are overwound alnico V pickups known for their tight bass, clear highs and pronounced mids. Famously, they’re also found on the Stevie Ray Vaughan signature Strat. And significantly, these pickups retail for about $200 for a set of three. Specs-wise, the American Special Strat has an alder body, modern C-shaped neck, 9.5-inch-radius fretboard, vintage-style bridge, and 22 jumbo frets – all fairly standard-issue on Stratocasters. Although Ibanez’s S series is designed to be far more versatile than the RG guitars, its Iron Label collection is built for one, brutal purpose: heavy metal. The SIX6FDFM represents exactly what we consider a ‘value-for-money’ guitar: it sports many premium specs, is skewed towards a single use, and, at a little under $1,000, won’t hemorrhage your bank account. The SIX6FDFM’s jaw-dropping aesthetics belie its price tag. It has an arched flame maple top on a bound mahogany body, a bound ebony fretboard, and a three-piece maple/purpleheart neck that has a colorful streak running down the middle. Only a Blue Space Burst finish is available, but, coupled with a matching headstock, it looks good enough to lick. There’s plenty of substance under all that style, too. Two DiMarzio-designed Fusion Edge humbuckers power the S series axe – they aren’t exactly after-market pickups, but are designed in collaboration between Ibanez and the pickup brand. These ceramic humbuckers are aggressive, articulate and loud, ideal for modern metal. And for a touch more versatility, both pickups have also been coil-split. Other specs on the guitar are similarly metal-inclined. It has a fast Nitro Wizard neck profile and a very flat 15.75-inch-radius ebony fretboard, a Gibraltar Standard II bridge that improves string resonance, and Gotoh MG-T locking machine heads for tuning stability. And a single master volume knob ensures nothing gets in the way of your shredding and riffing acrobatics. Sure, Cort may not possess the cachet of a brand like Ibanez or Jackson. But if you’re after a ‘cheap’ electric guitar for rock that’s worth a lot more than the sum of its parts, the X300 is right up your alley. For an electric guitar at this price, the Cort X300 is brimming with serious specs more typical of instruments double or triple the cost. It’s a Super Strat built for hard rock and metal, and its hardware, electronics and construction combine to grant the axe its shred cred. The stars of the show are inarguably the pickups: the EMG Retro Active Hot 70 set, which goes for $200 alone. This combines a ceramic humbucker at the bridge and alnico V humbucker at the neck – both open-coil – to produce the hot tones of Van Halen and other 70s hard rock acts. They’re active pickups, too, wired to a FET preamp that minimises noise and levels outputs. The X300’s other features and specs support the character of those EMGs. It has a comfortable compound radius maple fretboard, ergonomic body contours, 24 jumbo frets and a Floyd Rose Special tremolo system – all the better for fast, aggressive players. And you can’t ignore the guitar’s exotic looks, either. A flame maple top, available in three translucent finishes, on an American basswood body looks devilishly handsome, while all-black hardware and offset dot inlays give the six-string an understated quality. The X300 is a cheap guitar – but it’s far from a bad one. You’ll know the Epiphone Casino best as “John Lennon’s guitar,” but here’s a smaller version, modelled after the Gibson ES-339: the Casino Coupe. And just like with the big boy, you’ll get all that sweet, fully hollow goodness without breaking the bank. The first thing you’ll notice about the Coupe is its smaller body. It sits more comfortably on your lap and generates less feedback than its larger sibling – but without dramatically affecting the tone that made the Casino such an icon in rock ’n’ roll. Compared to, say, an Epiphone Dot, the Coupe offers a ‘woodier,’ more acoustic timbre. “Sparkly”, “bell-like” and “jangly” are descriptors often associated with the guitar and its stock pair of P-90s, and cranking the gain up elicits more a sizzle than roar. Be careful with the distortion, though – without a centre block like those you’ll find on semi-hollows, the Coupe is still fairly susceptible to feedback. There’s no disguising what the Jackson Pro Series DK2 Okoume is meant for: shredding. From the tonewoods to the construction to the feature set, everything on this guitar is designed to bring the best out of lightning-speed solos and other fretboard pyrotechnics. That it clocks in at under $900 off the rack makes the Pro Series DK2 a great value buy. The Pro Series DK2 is a rugged, performance-grade workhorse that’ll do just as well on the stage as in the studio. It has a lightweight okoume body – a tonewood that shares many qualities with mahogany – as well as Jackson’s fast maple ‘speed neck’, a compound radius ebony fretboard, and 24 jumbo frets. A recessed Floyd Rose 1000 double-locking trem system completes the shred-friendly features on the guitar. Electronics is another area where the Jackson shines. Two Seymour Duncans power the guitar: a JB Trembucker TB-4 at the bridge and a ’59 Model SH-1N at the neck. The former is a high-output alnico V pickup that produces a tight low end and strong upper mids, while the latter is a vintage-voiced pup that’s articulate, smooth and good for cleans. Compared to the more popular JS22 Dinky, this Pro Series DK2 model is a huge step up. It may not be as affordable as the feature-laden Cort X300, but with a more recognisable brand name, you’re guaranteed a higher resale value. There’s nothing much to say about a Stratocaster that hasn’t already been said over the 50 years since it made its debut. Fender’s flagship instrument shares the same reputation as a Les Paul: they’re among the most iconic electric guitars ever. And the Squier Classic Vibe 50s Stratocaster is one of the most value-for-money Strats out there today. Don’t be put off by the Squier logo on the headstock. This model encapsulates a Strat’s reputation of being a versatile axe that can swerve from rock to blues to funk to ambient – and everything in-between. The three alnico III single-coils, wired up in five positions, are partly responsible for that. You can go from glassy tones of the neck pickup to the bite of the bridge pickup to the ‘quacks’ of the positions in-between, the latter of which refers to two single-coils activated in tandem. Like many Fender Strats, the Classic Vibe 50s has a lightweight alder body, maple neck and maple fretboard. Its C-shaped neck and 9.5-inch fretboard radius mean it’s comfortable for both rhythm and lead playing, while a vintage-style synchronised tremolo bridge makes the guitar even more of an all-rounder. Wondering about the differences between the Classic Vibe 50s and the Classic Vibe 60s? Cosmetics notwithstanding, the latter has hotter alnico V single-coils and an Indian laurel fretboard. Everything else – including their price tags – is identical. One look at the Schecter Omen-6 and you’ll know it’s a metal axe. The made-in-Indonesia Super Strat is one of the brand’s most affordable instruments, but it’s a well-crafted, sleek-looking piece that aspiring riff gods will love to have in their arsenal. If you’re not a fan of the ‘quilted’ (it’s actually a printed image) top on the Schecter C-6, the Omen-6 will fit you just fine. Three sophisticated – if a little subdued – finishes grace the arched top of this six-string, the body binding looks premium, and those Gothic inlays are wicked enough for any metal band. Which is what you’ll be doing with the Omen-6: laying down heavy riffs and unleashing screaming solos. Two overwound Diamond Plus humbuckers are responsible for the guitar’s hot and thick output, while a thin C-shaped neck, 14-inch fretboard radius and extra jumbo frets keep things fast and comfy. Although this doesn’t have a tremolo for those dive bombs, a Tune-o-Matic bridge and string-through body ensure your sustain will sing for days. Other specs of the guitar are fairly ordinary: it has a basswood body, bolt-on maple neck, rosewood fretboard, a 25.5-inch scale length, and simple master tone and volume controls. If you’re lusting over a vintage-spec’ed Jazzmaster but don’t want to plonk down thousands of bucks for it, the Squier Vintage Modified Jazzmaster is right up your alley. The offset guitar retains many of the old-school specs that made the model famous back in the day, with a few modern enhancements to appeal to contemporary players. Despite its low price, this is not a guitar for newbies. The circuitry’s complex, the bridge is notoriously wonky, and it feels huge when you’re playing sitting down. But it is the most authentic Jazzmaster you can get for the price – it’s even more ‘traditional’ than the new Mexican-made Fender Players. A non-locking floating vibrato system and the vintage-style bridge – with those ‘grooved barrel’ saddles that many players consider unstable – are the other vintage-style specs on this guitar. They aren’t exactly downsides, though, as they contribute to the Jazzmaster’s cherished low sustain and sonic artefacts. On to the modern appointments. A pair of Duncan Designed JM-101B alnico V single-coils give this Squier that coveted clear, syrupy and mellow Jazzmaster tone that works brilliantly with effects – which is one reason why you’ll find many shoegazers, post-rockers and experimental musicians toting this iconic axe. 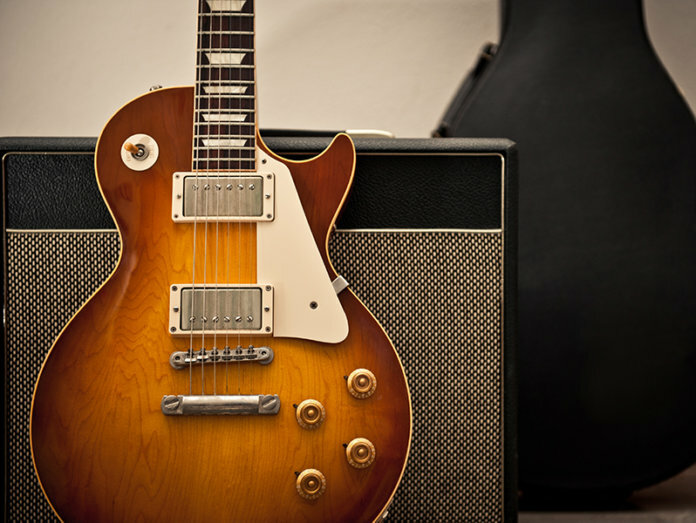 Alongside the Stratocaster, Les Pauls have defined rock ’n’ roll. Everyone from Jimmy Page to Slash to Zakk Wylde has wielded one of these, and the guitar’s fat, creamy tone with near-endless sustain is instantly recognisable. Not everyone can afford a bona fide Gibson, though, but the Epiphone Les Paul Standard makes those sounds accessible to most of us. Epiphone Les Paul Standards are built in China, South Korea or Indonesia. They no longer come with figured maple tops (you’ll find those on the Plustop PRO models), but have the cream neck and body binding, chrome pickup covers, and trapezoid inlays of their Gibson cousins. In other words, they are drop-dead gorgeous. They don’t just look the part, either. Epiphone Les Paul Standards come with the brand’s Alnico humbucker at the neck and Alnico Classic humbucker at the bridge, which yield the classic thick, saturated tone Les Pauls are renowned for. And like a Gibson, these Les Pauls have a set of volume and tone knobs for each pickup. The other specs on these also mimic those of a Gibson: a mahogany body and set neck, 12-inch fretboard radius, 24.75-inch scale, and Tune-o-Matic bridge, among others. If you’re hankering after a rock-ready guitar that won’t empty your pockets, the Epiphone Les Paul Standard should top your list. For a guitar that’s just under $500, the G2420 Streamliner channels a whole lotta Gretsch. Think ringing sustain, hollow-body construction and retrolicious looks. But it isn’t only for jazz cats and country pickers – this guitar has plenty of brawn, bite and balls, too. Besides its classic vibe, the best part about this guitar may be its Broad’Tron pickups. These were designed specifically for the Streamliner, and are known for their throaty midrange, booming lows and sparkly highs. They’re also louder than Gretsch’s other popular pups, the Filter’Tron, so push them hard and they’ll snarl and scream. Dial back the volume knob, however, and you’ll encounter the warmth and rounded tone for which Gretsch hollow-bodies are known. The other specs of the guitar are far from vintage. Take the (white-bound) nato U-shaped neck, 12-inch rosewood fretboard radius and 22 medium jumbo frets. Together with nickel hardware and gold knobs, they make a guitar whose beauty extends well below the surface. Weighing in at less than $400, the EC-256 is ESP’s budget version of models in its Eclipse line. And while it’s no mystery where it draws its good looks from, don’t let that distract you from its other features. Everything about the EC-256 is decidedly modern, and can take you from blues to rock to metal, easy. The EC-256 looks like a Les Paul Black Beauty, and has very similar specs. Like a mahogany body and set neck, 24.75-inch scale, a Tune-o-Matic bridge and a pair of humbuckers, in this case ESP Designed LH-150. The pickups here are a tad muddy when played clean, even when switched to ‘single-coil’ mode, but they’re easily swapped out, anyway. However, it isn’t quite as traditional as a Les Paul. Many features on the guitar are better suited for today’s players: a thin U-shaped neck that’s faster to play on, a flatter fretboard radius of about 14 inches, 22 extra jumbo frets, and coil-split humbuckers. A deeper cutaway also makes reaching those higher frets easier. Simply put, the Mitchell MD400 boasts features and specs that are more common on a guitar quadruple its cost. It’s a good-looking, versatile beast that you can use for pretty much any application. It’s more or less a Super Strat, but not of the headbanging variety. The MD400 has a gorgeous AAA quilt maple veneer top in a variety of translucent finishes, body and neck bindings, offset abalone dot inlays, and a carved mahogany body. But where it really shines is in its features. The MD400 has one alnico V humbucker at the bridge and one alnico V mini-humbucker at the neck. Both are ‘rail’-style pickups, which are quieter, and provide more consistent tone and sustain across the strings. Both pickups have been coil-split, too – so push or pull the master tone knob to disable one coil of each humbucker, effectively turning them into single-coil pickups. Other features on the instrument tilt towards the speed merchant category. It has a flat 15.75-inch fretboard radius, shallow C-shaped neck, 24 medium jumbo frets, dramatic bevels on both cutaways, and a string-through body and set neck for added sustain. Like we mentioned, the MD400 is not your average budget guitar. Older players will remember that PRS used to be the sole province of seasoned players or those with fat bank accounts. Not since 2001, when the brand launched the SE Standard range. And the 2018 PRS SE Standard 24 continues the series’ reputation for being solid, well-crafted, modern and versatile guitars. The SE Standard 24 is the budget version of the Custom 24, which is PRS’ flagship instrument. Besides their almost-identical looks (save for the Custom’s carved figured maple top), both guitars are some of the most versatile instruments in their price ranges. Blues, rock, metal, shoegaze, ambient – you name it, the SE Standard 24 can handle it. The 85/15 “S” humbuckers here – they’re affordable versions of the Custom’s 85/15 – are transparent, ‘hi-fi’, articulate and high-output. Lush while clean and thick when clipped, the pickups have also been coil-split to take you into glassier, single-coil territory. However, you can’t coil-split them individually to form HS or SH combinations, for instance. Even its other features don’t lean towards a specific style of playing. The SE Standard 24 has a very thin neck profile, moderate ten-inch fretboard radius, 25-inch scale, 24 frets and a moulded tremolo that, like the guitar as a whole, is amazing for its price. Check out our picks of beginner guitars, intermediate models, and the best axes $200 and $500 can buy.